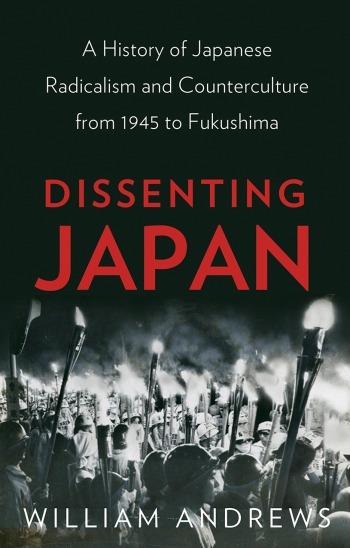 Dissenting Japan: A History of Japanese Radicalism and Counterculture from 1945 to Fukushima by William Andrews. London: Hurst, 356 pp., $45.00 (cloth). Not long ago, I had the opportunity to spend the morning at a castle on the coast of Ghana through which hundreds of thousands of captive men and women passed during the trans-Atlantic slave trade. My tour guide was very good, and, as he spoke, the tranquil white-washed courtyards and rammed-earth dungeons seemed to come alive with the suffering of the humans who had once inhabited them. I was struck forcefully as I stood there with a sense of how time obliterates the past—of how the suffering that took place here was so excruciating, yet the mere passage of time renders those same rooms echoingly empty, almost bland, unless their stories are repeated relentlessly. I had the same sensation on reading William Andrews’ Dissenting Japan. The book documents seventy years of challenges to the status quo, including the monumental protests against the Japan-U.S. Security Treaty, the anti-war rallies of the late 1960s that drew a cumulative 19 million people, the recent upsurge of post-Fukushima protest, and numerous instances of small-scale terrorism, hijacking, revolt, and dissident artistic expression. On its surface, the aim of this catalogue is to disprove “the myth that the Japanese are inherently conformist”—which, to anyone who has spent any time at all living in or studying Japan, is a somewhat obvious point. (As Andrews himself admits, “the narrative of conflict is actually a path fairly well trodden by Japan specialists and historians.”) But the book also does something else. It takes mundane places and reanimates them with their radical past. In doing so, it keeps alive a history that is at very real risk of disappearing into the apparent tranquility of the present. Take, for instance, Narita Airport. Not the Narita Airport of today, with its sanitized arrival halls and glass-shelved gift shops, but the Narita Airport of March 26, 1978. The brand new facility was set to open in just four days. For the preceding 11 years, farmers displaced by the project and their many supporters had been fighting the conversion of rural villages into airport runways. To these opponents, the project had come to symbolize the worst excesses of neoliberal capitalism, and they had waged all-out war (complete with underground bunkers and fortified towers) to prevent it—to no avail. Suddenly, following a final rally on the 26th, a burning truck full of protesters burst through the airport’s shiny new gates. As their comrades rushed the grounds chased by 14,000 riot police, a much smaller band of militants invaded the air control tower. They smashed equipment, hung a red banner, and painted a hammer and sickle on one of the windows. Think about that next time your flight glides down onto one of Narita’s runways. Or take the University of Tokyo’s Yasuda Hall on January 18, 1969, the height of the student protest movement. For the past year, students had been occupying buildings, battling riot police and one another, and subjecting captured professors to days-long public interrogation sessions. All of this had started with a conflict over policies at the medical school, but it came to represent much more: both dissatisfaction with the entire university system, and a powerful, amorphous rage against conventional society that was washing over elite campuses nationwide. Yasuda Hall—a formerly staid clock tower now decked out in slogans and a portrait of Mao Zedong—became the site of the students’ last stand against the police. For days, the nation watched on television as helicopters circled and students wearing plastic helmets and carrying wooden staves defended their position with hatchets, stones, and Molotov cocktails. Ultimately, they were ousted, and over 600 were put on trial. Many suffered the career consequences for the rest of their lives. Andrews’ history of dissent is by no means comprehensive or unflawed. He often comes off as condescending, and it’s hard to tell if he genuinely respects any of the people he describes. That—in addition to the huge scope of the book, which forces him to rush from one episode to the next—may explain why his tales of protest lack any really vivid characters. Their stories deserve to be told in more detail elsewhere. Still, for anyone who wants to understand Japan during the second half of the 20th century, this is an essential book to read.